Wireless locks are the up-and-coming thing; they will almost certainly increase in popularity for the foreseeable future. 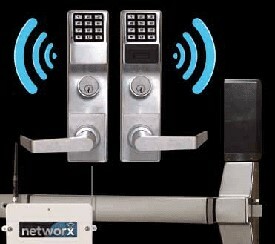 In this kind of access control system, traditional locks are replaced with wireless-enabled, electronic locks. The locks connect to a wireless access point or router, which allows numerous devices to communicate with each other. These wireless systems make it possible to combine access control and monitoring for almost any door. Wireless access control offers a wide range of features that may be selected as part of any particular system. Access points may either be limited or widely distributed throughout a building complex. The nature of access points varies as well. One option is to use keypads, on which employees can enter their passcodes. Another option is to use cards (or other forms of identification, including biometric), which can easily be scanned to provide access. Yet another option is mobile devices. In addition to the inherent security benefits of any good locking system, wireless access control offers “traceability”: i.e., it provides information about when, where, how, and – most importantly – by whom any particular door has been opened. This is often referred to as the “audit trail.” An audit trail allows an owner to understand better the movements of personnel (or customers) throughout a building, which could be helpful in terms of allocating the right amount of resources (such as heating or lighting). And of course, it would also be helpful for restricting access – either to certain areas or certain individuals. A major benefit of any access control system is the ability to execute a network-wide emergency lockdown within seconds. This can be launched from any lock, or from the network’s main computer. It can also be limited to perimeter doors or extended to a full emergency lockdown that covers interior doors as well. Such a feature may be especially important for schools. Even aside from the functional benefits of wireless lock systems, another plus is their ability to get the job done without requiring an electrician. An example is the Alarm Lock product called “Networx,” about which the company boasts that there are “no wires to run, and no access panels or power supplies to buy or install.” Wireless systems are ideal for any location where the structural conditions would make it especially hard to install wiring – for example, due to concrete or cinderblock walls, asbestos, or inadequate cabling. So even though the upfront price may be higher than wired systems, when you include the installation costs you may well come out ahead with wireless. Moreover, wireless access control also uses much less energy than wired systems, which is another major savings feature. Of course, nothing is perfect, and that includes wireless access control. One consideration is that they rely on battery power. The batteries are good for five years, so this is not a constant concern, but it does mean that it is necessary to periodically check and replace batteries. On the other hand, updating and maintenance are required, wireless access control makes this easy to accomplish. Rather than needing to locate and fix electrical problems, which can be difficult and time-consuming, it is usually sufficient to simply replace an old router. Another potential liability of wireless systems is that they rely on wifi, as a result of which they are vulnerable to signal interference. However, there are steps that may be taken to limit this vulnerability, such as moving or adjusting the router to allow channel auto-switching and using “repeaters” to boost the signal. And landlines have their own weaknesses since intruders can cut them. In sum, when you add up all the pros and cons, there is a lot to be said for considering wireless access control. Northeastern Security, Safe & Lock is always ready to discuss the options with you and to install a wireless system that meets the needs of your business.